As I have mentioned in previous posts, there are seminars at the RTR. This seminar is about small vehicle living. 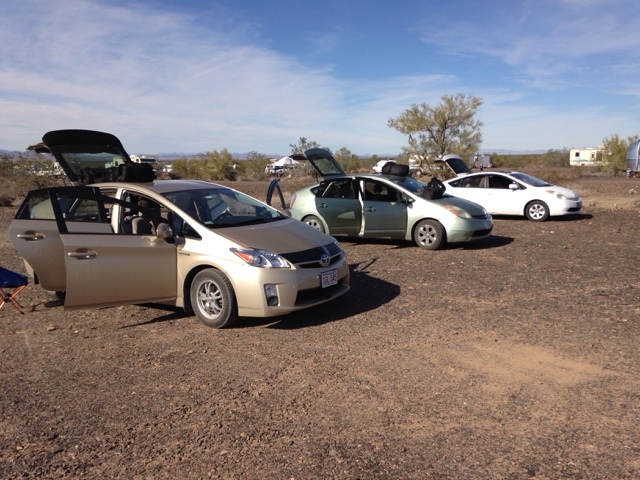 David, in the green Prius, had offered to Bob to have a seminar about Prius living and when I arrive and parked between David and Suanne it was expanded to include 4 Prius vandwellers, as there was one more Prius here. 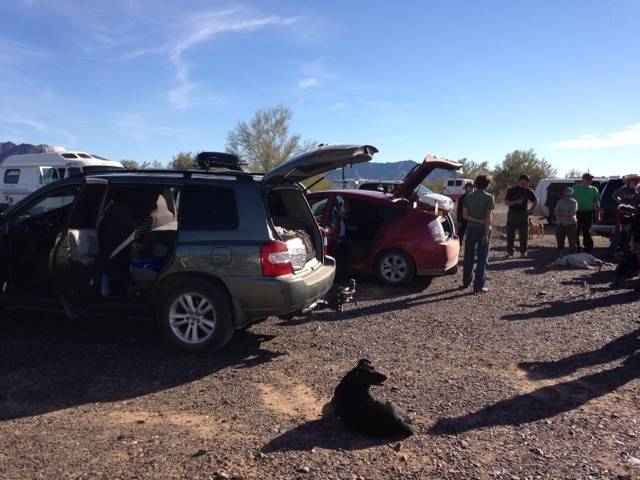 Then to attract others here in other smaller vehicles, the seminar was migrated to be a small vehicle living seminar. Each of us Prius owners have approached how to vandwell with the Prius a bit differently and we also had one Toyota Highlander Hybrid too. On the far right is Suanne's white Prius and she has been traveling in her Prius for many years and was part of my inspiration. David's has the green Prius in the center. Of coarse my Prius is gold and on the left. On the other side of my Prius and on the left is Terry's Highlander Hybrid. 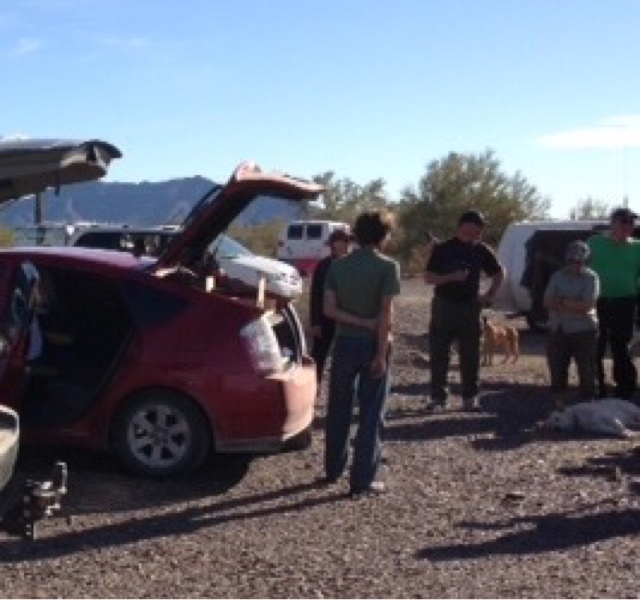 On the right is David's Red Prius. I have the compressor fridge that runs off the Prius or house batteries. I part time like Suanne wintering in the southwest. Here is one of this year's latest modifications. My Prius door table. The bags on the roof are my cooking utensils and food that fit under my bed as well as the new table. I removed all rear seats and built articulating plywood platforms for my bed and seat behind the driver. I can still take a passenger in the front passenger seat. I keep hot water for 24 hours in my thermos on the table. David approached his setup differently. He sleeps in a sleeping bag on a selfinflating mattress. He removed the 60% back seat fold-down and made a board to extend to the dash, having removed the front seat. 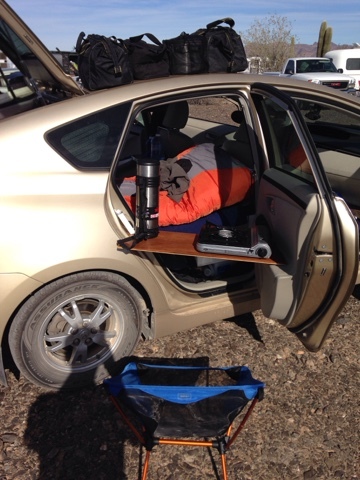 The board area in the front passenger seat area is a table where he has a single burner inductive cook stove powered by a 1000 watt inverter tied to the Prius 12 volt battery. This cooking setup gives him the ability to cook while seated in front drivers seat with no open flame. He doesn't use solar and let's his Prius power his electronics. He has a excellent cooler for his food. 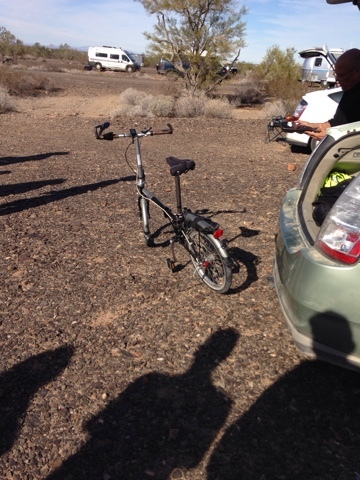 David is full time in his Prius and also has this nice folding bicycle that fits in the rear drivers side. He can still take a passenger in the rear drivers side seat. Suanne likes to stay in one place longer so she uses a pop up tent to use as "her garage". She uses a mattress and duvet to keep warm and sleeps on the 60% fold-down side. She uses 3 sheets and she removes one and sleeps on a clean one every few days and then washes all of them. It takes her done time to put it back together with three sheets to start all over. She cooks on a multi fuel (butane/propane) single burner stove using a collapsible table. 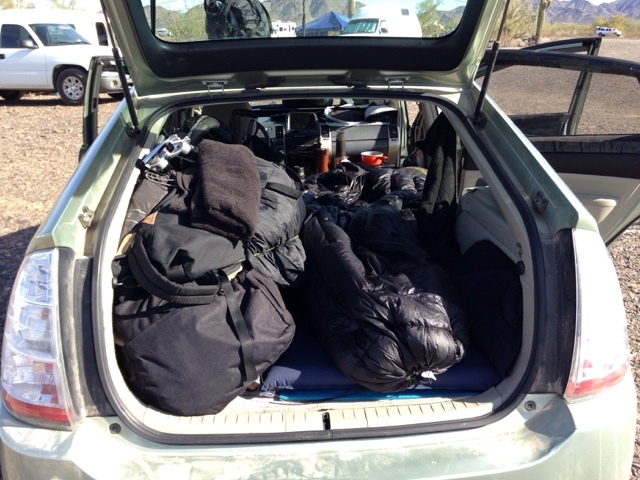 Suanne did not remove the rear seats. 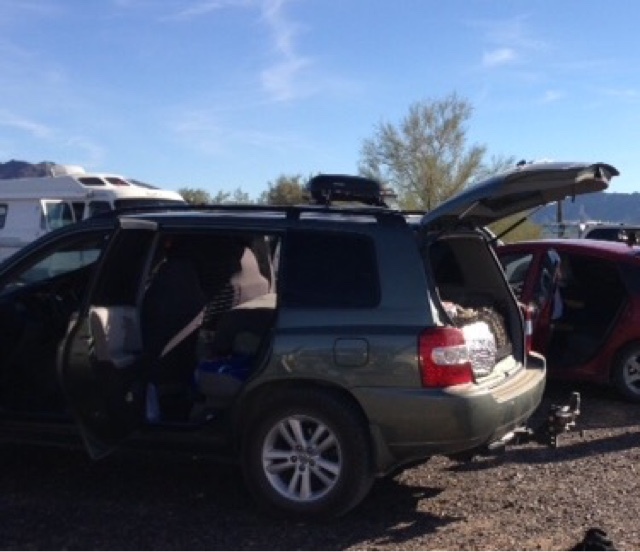 She doesn't use the Prius engine as much as she has folding solar panels she is trying out. She charges lithium car jumper pack that she will use for charging her things. She doesn't have a fridge or cooler and chooses to use items that she doesn't need to refrigerate. She can still take a passenger in the front passenger seat. Suanne winters in the southwest. 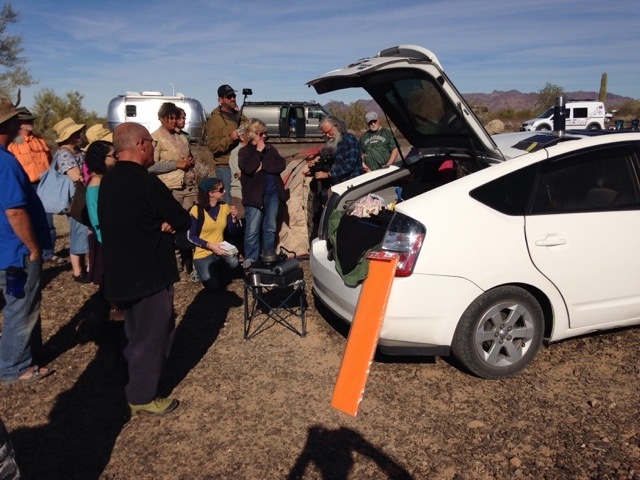 Terry's car was up next and I had some stragglers asking me questions so I didn't get to listen to her talk. She has a unique requirement as she travels with a small dog that she keeps in a cage in the front passenger seat. She uses the hybrid power of her car for climate control for her pet. She had a small fan running for her dog in the front seat. She sleeps in the rear and did not take the rear seats out. She just started and was getting ideas for the future. 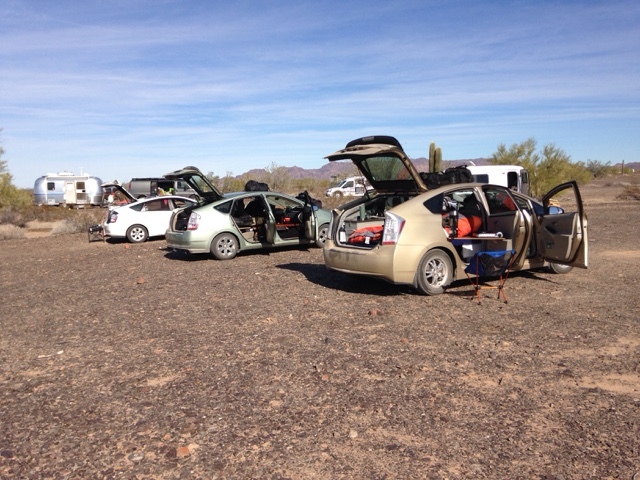 John was full timing in his Prius until he bought a Class C camper and now tows the Prius behind it. He will switch between living in one or the other based on his work. I also didn't get over to listen to John but I did notice that he had made a wooden platform in the hatch area where the privacy cover would go for storage. The seminar went over very well and there were a lot of positive comments. 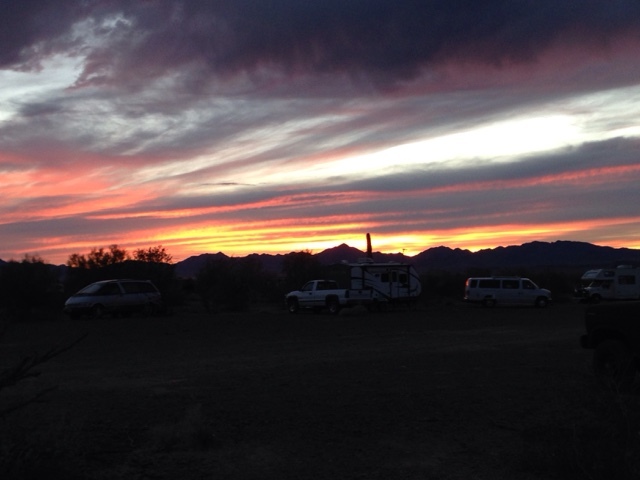 Ok, so you may be bored with this small car thing so I wow you with the gorgeous sunset we get most nights here in Quartzsite. I would love to see a bit of comparitive data on fuel consumption re: the prius v. highlander hybrid. John, Good Question but it needs include Prius differences. 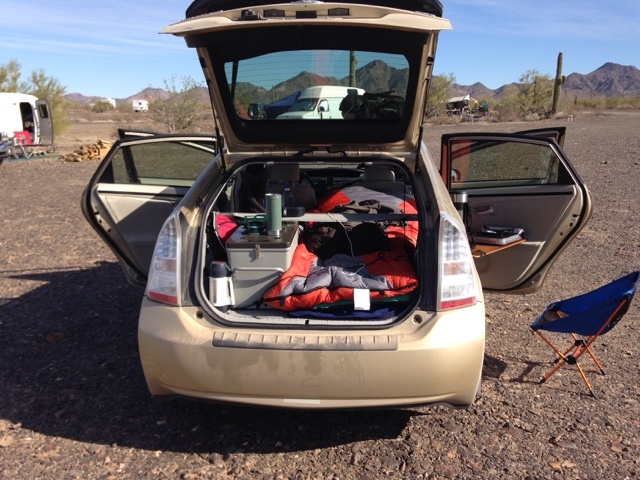 Suanne, David & John's Prius' are gen 2 and mine is gen 3. Typically on average gen 2 gets 5 mpg less than gen 3, so last year I got 52.2 mpg for 19,500 miles I understand they would see 5 mpg less on average. As you know it depends on any number of factors. Now for Terry's Highlander she told me that she gets 21 -23 mpg and I sensed she expected more as would I but I have no detail on her driving and usage of her Highlander in "ready mode". If I catch up with her I will ask a few more questions.